Oblivion. It’s such a startlingly powerful sounding word isn’t it? But what image does it conjure up in your head? Think about it. For some, it’ll be the true definition of the word: the state of being unaware of what’s happening around you – to be oblivious, you might say. Others may take it as something akin to an abyss – an impenetrable mire, from which nothing can escape. Others still may actually conjure up images of a video game from several years ago starring some demons, portals and wizards. It’s amazing what imagery can be conjured up from a single word! But which of these descriptions actually sums up Oblivion, the latest Tom Cruise-manned vehicle? Does it carry the word well, or is it too destined to just fade into oblivion? But what of the acting? Well, once again – it’s solid work. 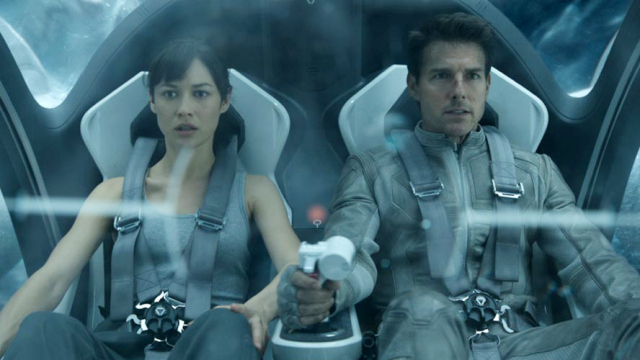 The core cast, which includes the aforementioned Tom Cruise, plus his co-guardian Victoria (Andrea Riseborough), the mysterious Beech (Morgan Freeman) and the newly-salvaged Julia (Olga Kurylenko) are all perfectly comfortable in their roles. It was nice to actually see Freeman in a role that’s not as typical as usual – he’s not playing the kind, older guy that helps out the hero of the film. Thank you! If anything it reminds me more of his role in Wanted – a film I’m not particularly keen on, but that’s what came up in my mind. As for Riseborough and Kurylenko? Solid performances, but I can’t say that their roles really sold their acting skills all that much. Tom Cruise however, is once again on great form doing exactly what Tom Cruise does. 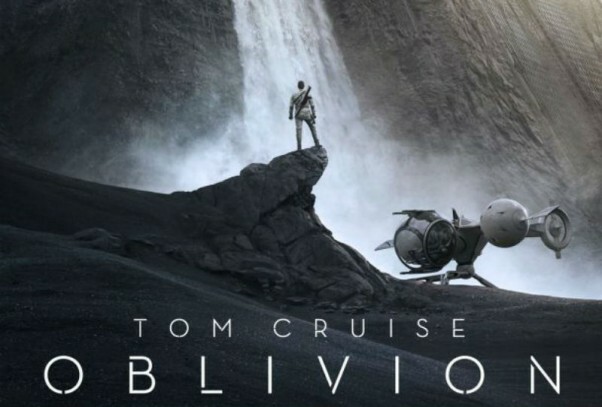 If you don’t like the guy’s acting, you probably won’t enjoy Oblivion, but if you do – you’re getting what you’d get in any modern era Cruise film… Once again, so far, so good – the film doesn’t spiral into an abyss yet. But it does come a bit closer to that hole… You see, the film makers have made a great deal of fuss over the winding plot, replete with its twists and turns. The trouble with this is that I expect the twists to be a) semi-logical, and b) unexpected. I’d say the film has two, perhaps three big twists, which I’m of course not going to spoil here. But one of them is hinted at if you have even a basic grasp of planetary facts. 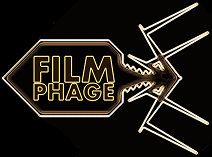 Now, let’s not pigeon-hole me here – The Phage is not a physicist, an astronomer or anything even remotely close. I just seem to absorb random facts that I’ve heard over the years, a bit like Bradley Cooper‘s character in Limitless. This is one of those times where I instantly recall something about the moon of Titan, which doesn’t really stack up with the rest of the above narrative. If anyone’s curious as to what that is – drop a comment below and I’ll use my Cooper-esque recollection abilities for you. That’s not all I have to say about these twists either. If you recall, in Side Effects I took umbrage with the fact that the main twist of that thriller was so out of left field that it seemed like the writers had somehow cheated you out of a proper plot. Well, we’re going back into the field on the left in Oblivion too. Whilst I’d already guessed what the “big” twist was, some of the minor ones were totally bonkers and got more and more surreal as they progressed, right up until the very end of the film. In fact, the end just made me feel a bit cold to it all… You’ll see what I mean. Damn, this is a hard movie to review without spoiling anything whatsoever! But I’m determined to not do it, lest I feel your wrath. Let’s just say that some of the twists once again made me think of Wanted… but for the wrong reasons. 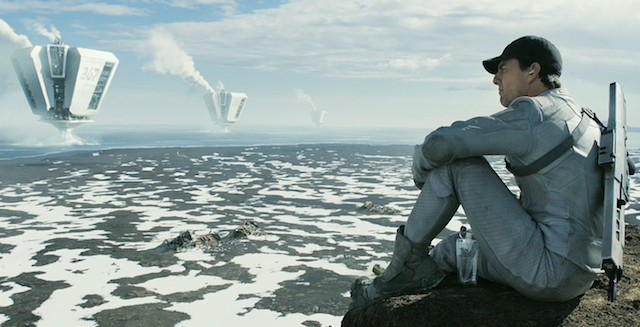 Having said all that, Oblivion is a solid slice of sci-fi and is set in a beautiful world. It deserves praise for that alone. It’s just that I sensed the film was a bit too drawn out at points and down-right daft at others. Sure, this is sci-fi – I should expect some ludicrous ideas and premises because it’s the future. Hell, the guy has a pulse rifle and flies around in a cool looking jet whilst living in an apartment in the sky. I can buy all that. I just wasn’t sold on some of the other plot details. Whereas some seemed too obvious, I was just oblivious to why they were included (see what I did there?). So, which of the definitions does Oblivion live up to? It’s certainly not destined to be thrown into an abyss, that’s for sure. It’s a solid film that deserves to be seen… but it also does seem a bit too “video game” like for my tastes. No, it didn’t feature any demons or wizards, but it did seem somewhat familiar, as most games do. You almost get the feeling that Oblivion is a Frankenstein sci-fi that welds together various other film plots to suit its own means. But if you’re oblivious to some of those other films then the film will be a lot more appealing. OK, I’ll stop using words beginning “oblivio…” now… Ob(li)viously, as it’s the end. 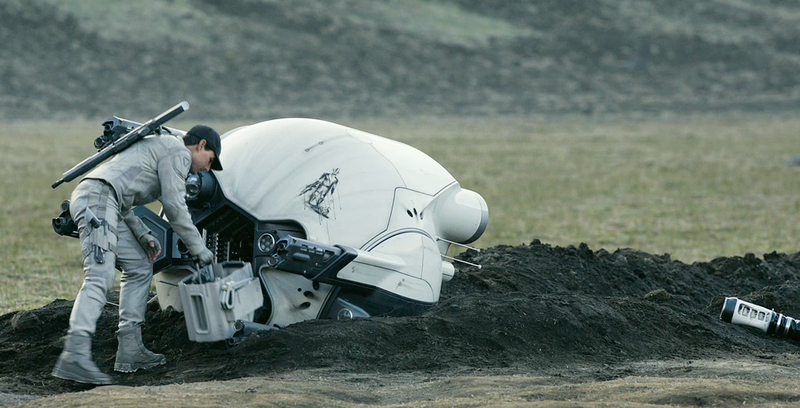 This entry was posted in Review and tagged aliens, Andrea Riseborough, apocalypse, drones, Joseph Kosinski, moon, Morgan Freeman, Oblivian, Oblivion, Olga Kurylenko, sci fi, Titan, Tom Cruise, Tron, twist, Wanted. Bookmark the permalink. Nice review! Off to see this next week I think. I was feeling kind of indifferent about it but at least it shouldn’t be a total disaster like I’m expecting After Earth to be.